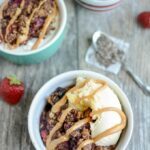 This Healthy Fruit Crisp can be made in the slow cooker or in the oven. It’s low in added sugar and packed with fiber and healthy fats. Serve it over yogurt or cottage cheese for breakfast or with ice cream for dessert. If you follow me on Instagram Stories, you’ve seen us eating this Healthy Fruit Crisp for the past two weeks straight. I first made it in the slow cooker. It only takes two hours which means you can throw it in before you start dinner and it’ll be ready for dessert. Then, I also tested it in the oven and it works equally well. The first time I made it with a mix of blueberries and strawberries (since we had a surplus after we went strawberry picking). The next time I tested it with some nectarines thrown in and it was equally delicious. My biggest suggestion though is to always include some blueberries if you’re serving it to picky kiddos like mine. The dark purple color helps camouflage the chia seeds and make them less noticeable. 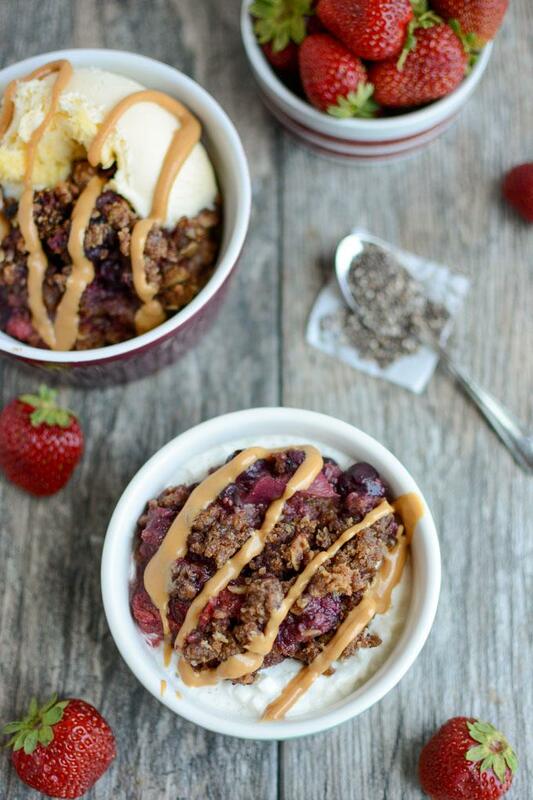 The great thing about this Healthy Fruit Crisp is that it works two ways. With only 2 Tbsp added sugar in the whole recipe, I feel good enough about it to serve it to Squish for breakfast. He loves it over plain yogurt or cottage cheese and he likes it both warm and cold. He also enjoys it warm with a scoop of vanilla ice cream on top….but who wouldn’t?! Like I said, you can make this in the slow cooker in just a couple hours. Perfect for those summer days when you don’t feel like heating up the kitchen with the oven. Or you can make it in the oven if you don’t feel like dragging out the slow cooker. I think I have a slight preference for the oven version, but both are delicious! Chop fruit into bite-sized pieces. Transfer to either a crockpot or a 9×9 pan lined with parchment paper. In a small bowl, combine oats, flour, sugar, cinnamon, flax, baking powder and hemp seeds and stir to combine. Cut butter into small chunks and add to the flour mixture. Cut in with a pastry blender or two knives until mixture resembles coarse meal. Add peanut butter and stir until coated with flour. Use your hands to mix everything together really well and crumble the peanut butter and butter so it combines with all of the flour and oats. Sprinkle crumble mixture over top of fruit. Cook at 350 for 40 minutes in the oven or 2-2.5 hours on high in the slow cooker. 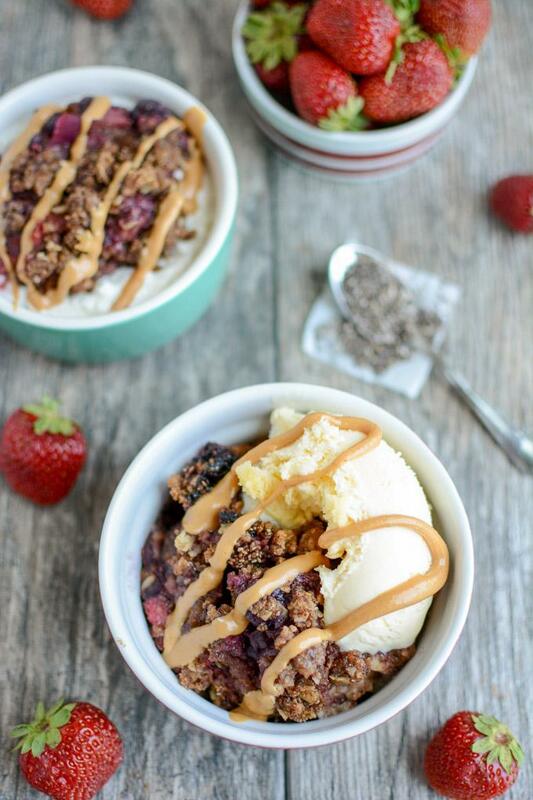 Serve over yogurt or cottage cheese, or topped with ice cream. 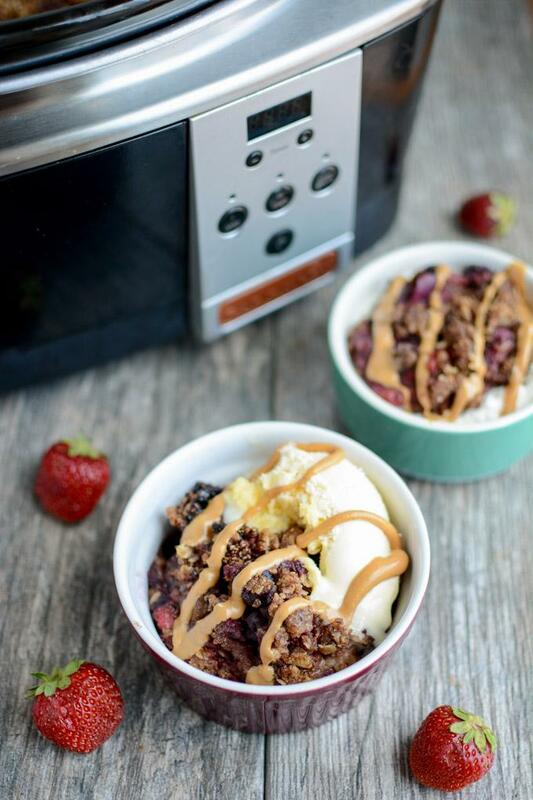 You could really use anywhere from 4-6 cups of fruit depending on how you like your topping to fruit ratio. If you use 6 cups of fruit, you could add 1 additional Tbsp of chia seeds. Since there’s minimal added sugar, the riper and sweeter the fruit is, the better. Sounds delicious right?! It’s one of my new favorites for sure! any thoughts on what to use to make this Gluten Free…. looks delicious! you could try it with oat flour or almond flour but i haven’t tried it myself! or a GP AP flour mix. I just made it with almond flour and it turned out well, maybe a little crumblier than it would with wheat flour. Super yummy still. Can you use fresh rubbard? hmmmm my guess would be no. but i haven’t tried it! I love that this is so versatile! Would using frozen fruits instead of fresh fruit work ? Would I need to increase the cooking time? I used a mix of half fresh, half frozen one time and the cook time was the same. I’d say check it after the prescribed time and then add more if needed but I think it should be about the same. Made this for July 4th. Sooooo good!!!! It was perfect served warm with vanilla ice cream. Can’t wait to try it cold with yogurt!!! yay! so glad to hear you guys like it! What’s the beige drizzle on top? We love this in our house! Our favourite is a 50/50 mix of fresh apples and frozen mixed berries. The kids love it plain or with yogurt (I haven’t given them the ice cream option yet :P). And I love it on top of oatmeal or by itself. This is a winner! Making half a dozen to stash before new baby comes. Hi Lindsay, this looks delicious is and I would love to give this a try. Do you have any suggestion as to how to make it dairy free? I’m guessing the texture migt be off if butter isnt used? But what do you think would be a close sub? Thanks in advance!